The standoff between Nevada rancher Cliven Bundy and the federal Bureau of Land Management (BLM) deescalated on April 12, when the bureau announced that it will stop its operation to confiscate Bundy’s cattle. 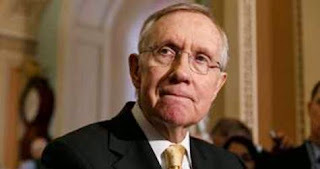 But another aspect to this ongoing story is jumping: The blogosphere is alive with allegations that Senator Harry Reid (pictured), and his son, Rory, have motivations of their own for wanting Bundy’s cattle off the disputed lands. This is a matter of fairness and equity, and we remain disappointed that Cliven Bundy continues to not comply with the same laws that 16,000 public lands ranchers do every year. After 20 years and multiple court orders to remove the trespass cattle, Mr. Bundy owes the American taxpayers in excess of $1 million. The BLM will continue to work to resolve the matter administratively and judicially. According to Bundy, whose family has been ranching in the area since the 1800s, the BLM’s armed invasion and occupation of Nevada has nothing to do with protecting the tortoise and everything to do with running him off the land, as it has already done to all of the other ranchers in Clark County. All men are by Nature free and equal and have certain inalienable rights among which are those of enjoying and defending life and liberty; Acquiring, Possessing and Protecting property and pursuing and obtaining safety and happiness. That which is unconstitutional, therefore, cannot properly be called legal. As the tension between Bundy and the BLM ratchets down, a number of conservative bloggers and pundits have raised questions about another angle in this case: Does the BLM want Bundy’s cattle off the land his family has worked for over 140 years in order to free up the land for the construction of solar panel power stations? That question was prompted, in part, by since-deleted information previously posted on the BLM website, information retrieved from Google’s cache. A PDF of the BLM’s document, “Regional Mitigation strategy for the Dry Lake Solar energy Zone: Technical Note 444,” produced by the BLM in March, can be found online.